Warning: repairs of this gage are complicated. Do-it-yourself attempts are likely to cause further—and expensive—damage. Professional repair service is highly recommended. See page 30 for details. For specifications, calibration, details and manufacturer supplied information about Interapid IRA2, see page 22. 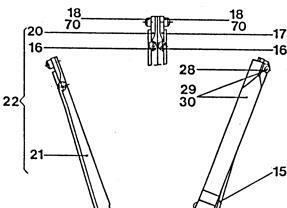 The only parts we can supply are the replacement contact points as shown below. On the drawing, they are shown as item #18. To order any of these contact points, click on the linked part number.